2. A network engineer issues the show cdp neighbor command on several network devices during the process of network documentation. What is the purpose of performing this command? 3. Users are reporting longer delays in authentication and in accessing network resources during certain time periods of the week. What kind of information should network engineers check to find out if this situation is part of a normal network behavior? 4. In which step of gathering symptoms does the network engineer determine if the problem is at the core, distribution, or access layer of the network? 5. A network technician is troubleshooting an email connection problem. Which question to the end-user will provide clear information to better define the problem? 6. A team of engineers has identified a solution to a significant network problem. The proposed solution is likely to affect critical network infrastructure components. What should the team follow while implementing the solution to avoid interfering with other processes and infrastructure? 7. After which step in the network troubleshooting process would one of the layered troubleshooting methods be used? 8. A user reports that the workstation cannot connect to a networked printer in the office in order to print a report created with word processing software. Which troubleshooting action by the helpdesk technician would follow the divide-and-conquer approach? 9. A network engineer is troubleshooting a network problem and can successfully ping between two devices. However, Telnet between the same two devices does not work. 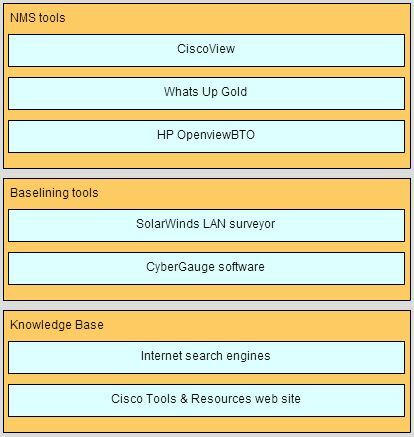 Which OSI layers should the administrator investigate next? 10. Which troubleshooting method begins by examining cable connections and wiring issues? 11. Which number represents the most severe level of syslog logging? 12. A company is setting up a web site with SSL technology to protect the authentication credentials required to access the web site. A network engineer needs to verify that the setup is correct and that the authentication is indeed encrypted. Which tool should be used? 15. An administrator is troubleshooting an Internet connectivity problem on a router. The output of the show interfaces gigabitethernet 0/0 command reveals higher than normal framing errors on the interface that connects to the Internet. At what layer of the OSI model is the problem likely occurring? 16. Users report that the new web site http://www.company1.biz cannot be accessed. The helpdesk technician checks and verifies that the web site can be accessed with http://www.company1.biz:90. Which layer in the TCP/IP model is involved in troubleshooting this issue? 17. A user reports that after an OS patch of the networking subsystem has been applied to a workstation, it performs very slowly when connecting to network resources. A network technician tests the link with a cable analyzer and notices that the workstation sends an excessive number of frames smaller than 64 bytes and also other meaningless frames. What is the possible cause of the problem? 19. A user in a large office calls technical support to complain that a PC has suddenly lost connectivity to the network. The technician asks the caller to talk to nearby users to see if other machines are affected. The caller reports that several immediate neighbors in the same department have a similar problem and that they cannot ping each other. Those who are seated in other departments have connectivity. What should the technician check as the first step in troubleshooting the issue? 21. After cables were reconnected to a switch in a wiring closet, several PCs that had been previously configured manually can no longer access resources outside the local network. The PC configurations were not altered in the process and resources on the local network can still be accessed. What is a possible cause of the problem? 22. Refer to exhibit. A network engineer is troubleshooting a WAN connectivity problem. A ping to a remote router is successful and an attempt to telnet to the same router displays the exhibited output. What does the output verify? 24. Fill in the blank. Use the ARP cache to verify IPv4 address to Layer 2 Ethernet address mappings on a host computer. 25. 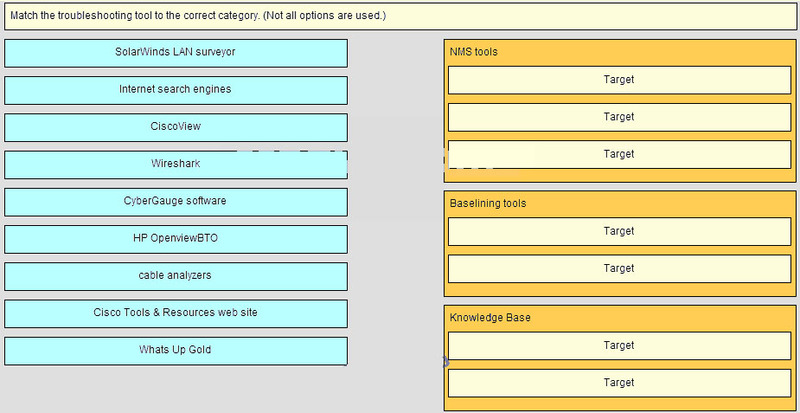 Match the troubleshooting tool to the correct category. (Not all options are used. [#] Order does not matter within this group. [*] Order does not matter within this group. 26. Which statement describes the physical topology for a LAN? 27. What is a purpose of establishing a network baseline? 28. The newly configured ASBR that connects a company to the Internet has a default route configured and has the default-information originate command entered. Devices connected through this router can access the Internet. The problem is that no other OSPF routers have a default route in the routing table and no other users throughout the organization can access the Internet. What could be the problem? 29. An internal corporate server can be accessed by internal PCs, but not by external Internet users that should have access. What could be the issue? 30. A networked PC is having trouble accessing the Internet, but can print to a local printer and ping other computers in the area. Other computers on the same network are not having any issues. What is the problem?